A padded collar and tongue for comfort. Lace closure ensures a secure fit. adidas 3-StripesÂ on sides. Perforations in the upper for increased airflow. Breathable mesh lining. Lightweight Cloudfoamâ" sockliner provides ultra-light cushioning and comfort. Classic adicross street last. Highly flexible spikeless outsole with puremotionÂ features 100 strategically-placed lugs for optimal grip and on-and-off course versatility. Adiwearâ" outsole provides long-lasting abrasion resistance and versatility. True Linskwear True padwan Junior Golf Shoes Finally a TRUE for the kids! The TRUE padwan, like its parents the TRUE sensei and TRUE jade, was designed for golf but ready for anything. It is probably the most versatile kids golf shoe. It provides a super comfortable platform and breathable upper that would allow juniors to wear it off the course to school or for everyday play. 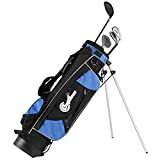 Precise Golf XR9 8 Piece Junior Golf Set - Ages 9-12 Set Includes Driver, Hybrid, 6/7 , 9/P Stainless Iron, Putter, Deluxe Stand Bag and 2 Matching Head Covers. Right handed only.